From the kitchen of One Perfect Bite...I have a collection of recipes that are used primarily for cooking when we are away from home, but staying in accommodations that have kitchens. I learned a longtime ago that the presence of restaurants guarantees only that one will not starve, certainly not that one will dine or even eat well. It's sometimes really nice to have the option of eating in. From a vacationing cook's perspective, however, this works only when the recipes are quick and easy to make and can be assembled with minimal or substandard equipment. No one, escaping daily tedium, wants to spend hours in the kitchen, so, easy on, easy off food becomes de rigueur. Today's tart is a case in point. It is good enough to serve to guests at home, but a bit of deconstruction makes it possible to have this lovely treat wherever you travel. The crust is as negotiable as your standards. It need not be homemade and a really good commercial crust or puff pastry will work just fine. 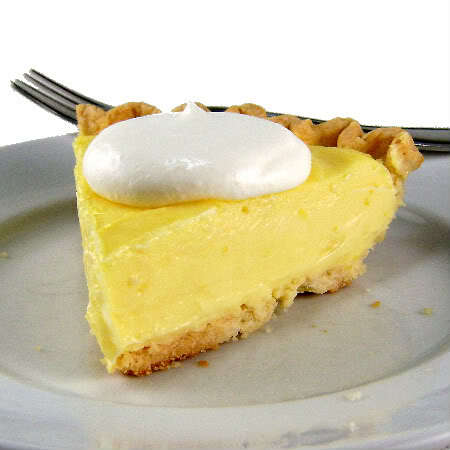 This tart is really a lemon pie that has lost its meringue. With the meringue gone, the tart can be made in a saucepan with a wooden spoon and simply chilled until it can be cut. Whipped cream or a whipped topping is usually served with this, but, when fresh berries are available I prefer to use them. A quick look at the recipe will convince you how easy this is to do. This, by the way, ia a wonderful recipe for new cooks to try. I can assure you it's delicious. Here's the recipe. 2) Line a tart or pie pan with pastry. Flute edges. Prick bottom of sides with fork. Bake until light golden brown, about 20 minutes. Remove from oven. Cool to room temperature. 3) Combine sugar, cornstarch, lemon rind, lemon juice and egg yolks and milk in a heavy saucepan. Cook on medium heat until thick, stirring constantly. Add butter and let mixture cool to room temperature. Stir in sour cream and pour filling into tart shell. 4) Refrigerate for at least 4 hours. The pie can be refrigerated for up to 24 hours. Top with dollops of whipped cream just before serving. Yield 8 to 10 servings.